Terry Fallis had an interesting career trajectory into the world of politics; having earned an engineering degree at McMaster he talked of being slowly engulfed in student politics until he became president of the student’s union. We resonated with this involvement, as many of us have backgrounds in student governance and were opened to the world of politics this way too. We admired his early work with Jean Chretien on the 1984 federal campaign, where he plunged into that opportunity at the young age of 24, and his later role working for the Minister of State for Youth. It is evident that he has a passion for developing and engaging young minds in politics and admires our involvement as interns with OLIP. He spoke a lot about the difference between politics and policy and his learnings being a political staffer. His current work is also rooted within the world of government relations and consultancy. Many of us had read his books for both school and pleasure, and appreciated the opportunity we had to inquire about his humour, wit and satire. We enjoyed all of his anecdotes and look forward to him being an annual meeting for each OLIP cohort. We met with former Premier David Peterson in his offices at Cassels Brock and Blackwell LLP. The Hon. David Peterson was the Premier of the Province of Ontario between 1985 and 1990. The list of his achievements post-politics is almost as impressive as his time in political office. Since retiring, he’s held several positions, including a Chancellor of the University of Toronto, director of St. Michael’s Hospital and Chairman of the successful Toronto Bid for 2015 Pan Am Games. In addition to sitting on the board of several public and private companies, he’s also the Founding Chairman of the Toronto Raptors Basketball Club Inc. and Chapters Inc.
We spoke about his early career in politics, and his successful bid for the leadership of the Liberal party. The Hon. David Peterson discussed with us the reasons why he thought the Liberal Party won in the 1985 election, and the values that drove his political decisions. We also talked about his last year in office, and the event that preceded it, such as the death of the Meech Lake accord. After his retirement from politics, Mr. Peterson became passionate about the issues that former parliamentarians face after leaving office and helped create the Ontario Association of Former Parliamentarians. It was a privilege to meet with the Hon. David Peterson, and we are grateful for the career and personal advice that he shared with us. One of the most appealing aspects of OLIP is the ability to have candid conversations with some of the influential individuals in Ontario’s political process. We began our series of premier meetings with Dalton McGuinty, the 24th Premier of Ontario. At the start of the meeting, Mr. McGuinty presented us with a copy of his book, Dalton McGuinty: Making a Difference. Since we had just celebrated Josef’s birthday, we decided he should take it and Mr. McGuinty gladly signed it for Josef. Mr. McGuinty began by affirming the importance of remaining idealistic despite the changing circumstances within politics. His ability to remain idealistic came from his philosophy that we have a need to do something lasting with our lives for others and create a meaningful difference. Mr. McGuinty firmly stated that in his 22 years within politics, he never regretted anything. As Mr. McGuinty recalled his leadership race, we were all amazed that he was able to become leader despite coming fourth on the first ballot but winning the leadership on the fifth ballot. When describing his years as Premier, we particularly noted he chose to include all who ran against him within his cabinet because he wanted their perspective to be used for the advantage of Ontarians. Mr. McGuinty was unique as he included every MPP in the government caucus in cabinet committees because he wanted more MPPs to have a meaningful influence on policy decisions. Mr. McGuinty ended our meeting by stressing that the best leaders reinforce what we all have in common. You have to be mindful of regional concerns however we are all in this together, as one Ontario. Thank you Mr. McGuinty for the great conversation! 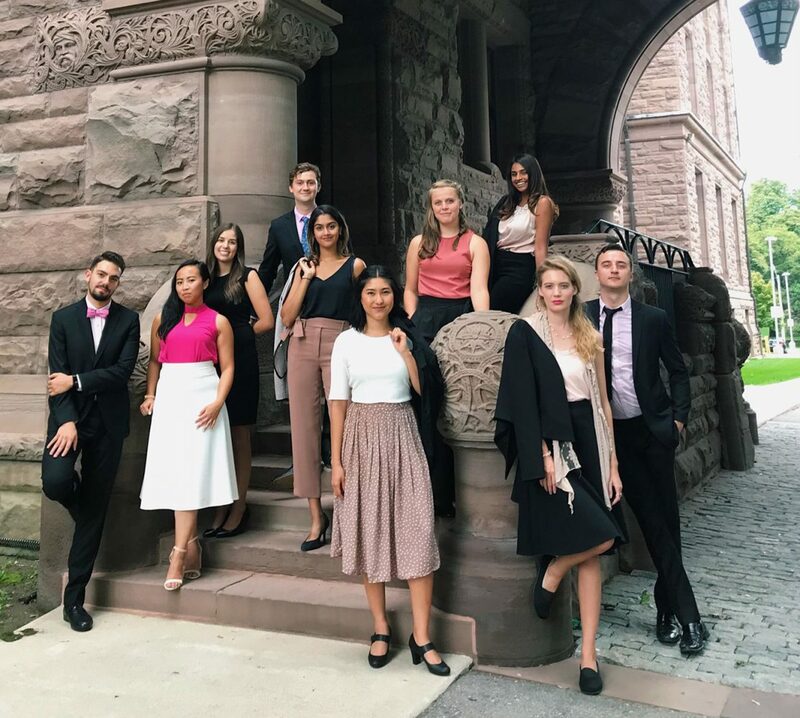 Now that we have started our placements with MPPs, Fridays are our days to reconnect with each other and have thought-provoking and inspiring meetings with interesting Ontarians. One such meeting was with National Post columnist Andrew Coyne. In addition to his wit in print, Mr. Coyne is well known for his unique, but well argued perspectives on Canadian politics. A previous national editor of Maclean’s, Mr. Coyne has also been featured in a variety in a variety of publications like the Financial Post, the Globe and Mail, and the New York Times. He also appears weekly on the “At Issue” panel on CBC’s the National. Mr. Coyne has written prolifically on the merits and minutia of proportional representation. An advocate for voter reform, he explained the political and policy constraints of the variety of systems, whether they be ranked ballots or single transferrable votes. He also pontificated on the future of voting reform movements in Canada and the provinces. Mr. Coyne was able to educate us on party politics, particularly how it changes approaching an election – an phenomenon we will experience first hand this year. Of particular interest is the impact of recent campaign finance and advertising reforms. It will also be interesting to spectate the interplay between persistent issues (unemployment, education, healthcare, energy) and wedge and micro-focus policies. A common theme in our conversations with media members has been their approach to writing about politics, as well as the changing media landscape. Mr. Coyne provided us with valuable context on the role of advertising in publications throughout history, as well as the impacts of and varied approaches to technology. In addition to the failings of the newspaper industry, Mr. Coyne contemplated partisan media, emerging opportunities, and the future of legacy media around Canada and the world. Thank you Mr. Coyne for your continued support of the Ontario Legislature Internship Programme. We are grateful for your frankness and answers to all of our questions. We were grateful to meet with one of our sponsors, the Lawyers Professional Indemnity Company, also known as LawPRO. The company is owned by The Law Society of Upper Canada and provides professional liability insurance for private practice lawyers in Ontario, a mandate provided by the Law Society Act. Indemnity coverage has been mandatory for Ontario lawyers since 1972. LawPRO’s President and CEO Kathleen Waters, Vice-Presidents Daniel Pinnington and Raymond Leclair, and Claims Prevention and Stakeholder Relations Coordinator Tim Lemieux took us through an overview of their mandate, the evolution of LawPRO, the types of coverage offered by LawPRO, and the changes affecting their profession and industry. Those of us considering careers in law were particularly interested in the causes of claims and the claims resolution process, as well as innovations such as Title Plus Insurance and Excess Insurance. The rest of us were captivated by the way public policy impacts the work of LawPRO and lawyers, as well as comparisons of professional liability insurance across jurisdictions. Part of LawPRO’s role is claims prevention through education and training. Due to changes in society and law, LawPRO has also addressed serving Indigenous clients, preventing fraud through bad cheques and real estate scams, cybercrime, and social media. These initiatives have also extended to current law students and also members of the public through video or guides on renting apartments. Thank you LawPRO for educating us about your industry and engagement with the policy process, as well as your continued support of the Ontario legislature Internship Programme.